‘Pinocchio‘ is a very dark, bleak, sinister story and world when you get right down to it. An older, lonely toymaker with a couple pets wishes his latest marionette he names Pinocchio to be a real boy, so he can have a family. The blue fairy grants his wish, but with some strings attached. Pinocchio must indeed act the part of a real boy, meaning he can’t lie, cheat, steal, and must always be honest and good person. There is even a cricket named Jiminy to guide him through the good and bad paths. Needless to say, a couple of bad guys con Pinocchio who sells him to a fat, scary guy named Stromboli, who runs a “theme park” named Pleasure Island, which is solely inhabited by young boys. These boys are shown everything their heart desires in the form of toys, food, and money, but if they give into this temptation, they are turned into donkeys. 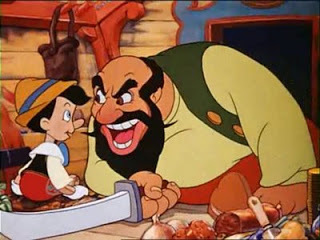 Next thing you know, Pinocchio has escaped and must save Geppetto from the stomach of an evil giant whale – literally. I just wish I was there during the production and script meetings, because you know there was some vintage weed going back and forth. Those are some seriously scary and sadistic situations. It ends well, but the journey there is a dark one. There are some great messages though throughout, being that one should never stray into corruption and always be an honest and good individual, or their will be some dire consequences. Before this, we were used to seeing a princess being saved be a prince. All is happy go lucky. That’s not the case with ‘Pinocchio’, which makes it all the more original and entertaining. Nobody here knows a princess, a real one at least, but we all know or we all know ourselves as we’ve always struggled between doing the right thing. ‘Pinocchio‘ ever so subtly covers these conflicts throughout the course of the film with grace and a little absurdity. It’s with that absurdity that we remember everything it tries to say to us, while being highly imaginative and entertaining. A perfect movie indeed. 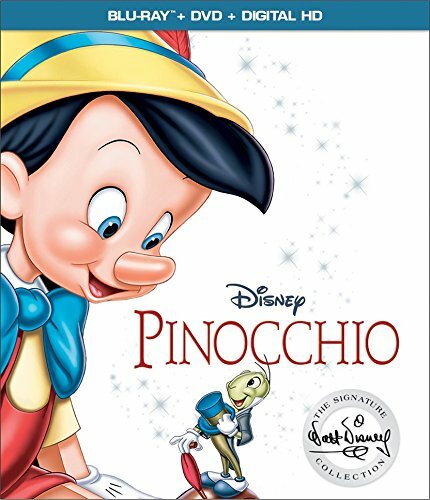 The Video: Again, this ‘Pinocchio‘ Signature Series release is the same as the previous 70th Anniversary edition, which is just fine by me, because that new video transfer is flawless and perfect in every way. This was a new 1080p HD transfer from Disney in 1.33:1 aspect ratio. Everything about is amazing. There is more detail in the painted backgrounds and every line of animation i crystal clear. The small elements of the wooden toys and hair look even better here as the colors are robust and pop right off screen. For being more than 70 years old, this print has no stability issues or any debris, dirt or scratches. What a fantastic looking video presentation. The Audio: Of course this film had a 1.0 mono mix with it, however Disney did their best to give us a lossless DTS-HD 7.1 MA option. I certainly applaud the effort, but for a film like this, a 7.1 option isn’t always the one to go with. I did love some of the immersion that it creates with the surround speakers and heavier low end with the bass, but at times, it all felt soft, vague and muted. Directionality on the 7.1 mix is average at best too. Dialogue is clear and easy to follow, but can be softer in some scenes on the 7.1 mix. Needless to say, stick with the mono 1.0 mix, because it’s perfect. There were no pops, cracks, hiss, or shrills here. The ‘Pinocchio’ Project: When You Wish Upon A Star (HD, 6 Mins.) – This is set into two segments and covers the making of the music video for ‘When You Wish Upon A Star’ as well as the actual music video. Walt’s Story Meetings: Pleasure Island (HD, 7 Mins.) – This is a vocalized recreation of some of the meetings Walt Disney had when making ‘Pinocchio’ with tons of sketches and photos. In Walt’s Words – ‘Pinocchio’ (HD, 5 Mins.) – Here is some vintage footage of Walt, discussing making ‘Pinocchio’ from 1956 and how WWII had an impact on the studio. Oswald The Lucky Rabbit in ‘Poor Papa’ (HD, 6 Mins.) – A new cut of the old black and white cartoon, starring Oswald. Audio Commentary – Leonard Maltin, Eric Goldberg, and J.B. Kaufman discuss all the amazing history, production, and impact that ‘Pinocchio’ had on the world. This is a fantastic commentary and should be listened to. Unfortunately, the picture-in-picture commentary track is not here, just the audio. Song Selection (HD, 11 Mins.) – All of the songs can be viewed here from the film with lyrics. No Strings Attached: The Making of ‘Pinocchio’ (HD, 56 Mins.) – Here is a great behind the scenes featurette with interviews and footage from the making of the animated film. This covers a lot of what the commentary track says, but is none-the-less engaging. The Sweatbox (HD, 7 Mins.) – This is a badass featurette that talks about a small screening room where cuts and dailies of Disney films were screened for Walt himself. Deleted Scenes (HD, 11 Mins.) – An alternate ending along with other deleted scenes are here. All of which are worth watching. All of these are in storyboard form. Geppettos Then and Now (HD, 11 Mins.) – This takes a look at toys and toy making over they years. Live Action Reference Footage (HD, 10 Mins.) – Some old silent footage of people and sets that were used for reference in animating the characters and locations. Trailers (HD, 5 Mins.) – Trailers for the film throughout the years. Storyboard To Film Final Comparison (HD, 4 Mins.) – Here we have a few storyboards that are show in a side by side comparison with the final image of the film. A Wish Come True: The Making of ‘Pinocchio’ (HD, 5 Mins.) – A very short making of that doesn’t go into a lot of detail. Weird. When You Wish Upon A Star Music Video by Meaghan Jette Martin (HD, 3 Mins.) – The music video that is not all that great. 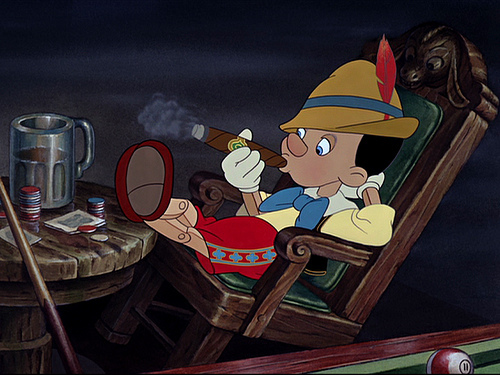 ‘Pinocchio‘ is one of the finest films ever to grace our lives. It has a ton of meaning and messages we can all hold true to this day. This release is the Disney Signature Series Edition, that has the amazing video quality video presentation as well as new and rolled over bonus features. Not only that, we now have DVD copy and a digital download with the film. This entry was posted on Monday, February 13th, 2017 at 5:44 pm	and is filed under Film, News. You can follow any responses to this entry through the RSS 2.0 feed. You can skip to the end and leave a response. Pinging is currently not allowed. « Blu-ray Review: ‘Poltergeist III’!